If you would like more information about Brain Injury Services Coordination or would like to make a referral, please call (865) 331-1499. 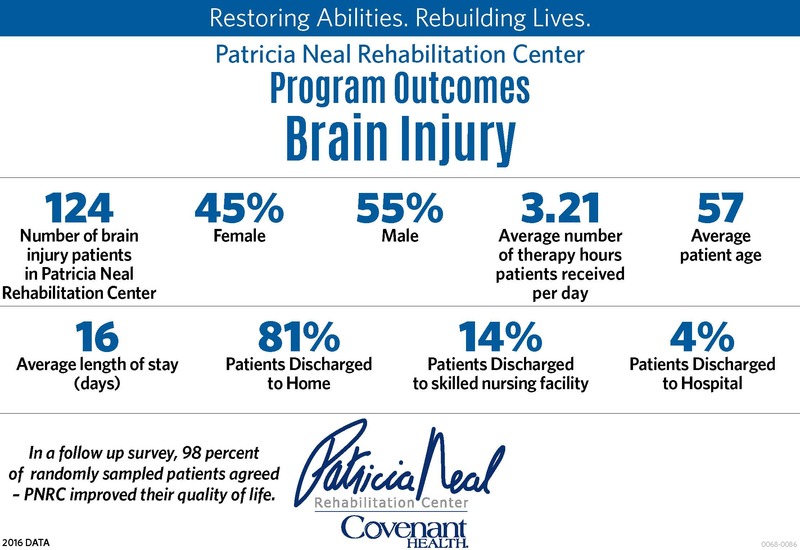 The Brain Injury Program of PNRC is dedicated to providing services to persons with brain injury with associated impairments and disabilities to help them regain the greatest amount of independence and enjoy the highest quality of life. Services will include appropriate intervention along a continuum of care that best fits the needs of the patient from inpatient to outpatient with coordination of available community services. Patients and families are a vital part of the rehabilitation team and must participate equally with the interdisciplinary team in developing an individualized treatment plan. Progress towards defined goals is reviewed in a patient team conference weekly. All patients are under the constant care of trained staff with brain injury knowledge and a physiatrist, a doctor who specializes in physical medicine and rehabilitation, who with the case manager will coordinate the highly skilled team of professionals. The environment is designed to facilitate cognitive, physical, educational, psychosocial, spiritual and behavioral needs of the BI survivor. Patients in the BI Program are treated with the latest state-of-the-art methods and equipment. Professional staff members in the BI Program are continually updating treatment skills and techniques to incorporate into the most modern treatment for those with brain injury. Fort Sanders Regional Medical Center has received a grant from the Tennessee Department of Health / Traumatic Brain Injury Program to provide services to individuals with brain injuries and their family members in fourteen East Tennessee counties. Service Coordination is designed to bridge the gap in services to individuals with brain injuries. The Service Coordinator evaluates the needs of each individual and identifies appropriate resources within the community. Services include assistance with applying for Social Security benefits, TennCare and insurance issues, and referral to appropriate housing. Referrals to this FREE service can be made by the individual with a brain injury, family members, rehabilitation facilities, or any affiliated professional in the community. For information about Brain Injury Services Coordination in other counties in Tennessee, please call (865) 331-1499.